What would you do if you were on a borehole drilling expedition and tapped into 1,000 degree Celcius magma at slightly over a mile deep? at Krafla in 2009 felt a sense of accomplishment. It was only the second known instance of drilling onto magma (the first was in Hawaii in 2007 and there were on a search for high-temperature geothermal resources. A steel casing, perforated in the bottom section closest to the magma, was cemented into the well and then the hole was then allowed to heat slowly and eventually allowed to emit superheated steam for the next two years. The project showed that they were able to drill down into molten magma and control it, that it was possible to set steel casing in the bottom of the hole and for superheated, high-pressure steam to blow for months at temperatures exceeding 450 C, a world record for geothermal heat. 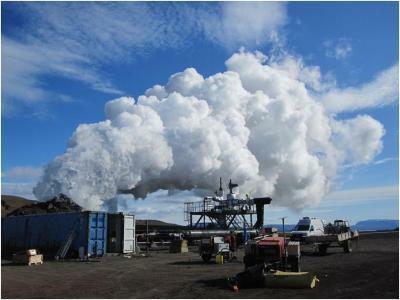 The project, IDDP-1, fed steam directly into the existing power plant at Krafla, demonstrating that a high-enthalpy geothermal system could be successfully utilized. The drill site of IDDP-1. Nearby is the explosive volcanic crater Víti, which erupted in 1724 AD. Credit: Guðmundur Ó. Friðleifsson. "In the future, the success of this drilling and research project could lead to a revolution in the energy efficiency of high-temperature geothermal areas worldwide," said co-author Wilfred Elders, a professor emeritus of geology at the University of California, Riverside. "Essentially, the IDDP-1 created the world's first magma-enhanced geothermal system. This unique engineered geothermal system is the world's first to supply heat directly from a molten magma." Elders explained that in various parts of the world so-called enhanced or engineered geothermal systems are being created by pumping cold water into hot dry rocks at 4-5 kilometers depths. The heated water is pumped up again as hot water or steam from production wells. In recent decades, considerable effort has been invested in Europe, Australia, the United States, and Japan, with uneven, and typically poor, results. A flow test of the IDDP-1 well at Krafla. Note the transparent superheated steam at the top of the rock muffler. Credit: Kristján Einarsson. The IDDP is a collaboration of three energy companies — HS Energy Ltd., National Power Company and Reykjavik Energy — and a government agency, the National Energy Authority of Iceland. 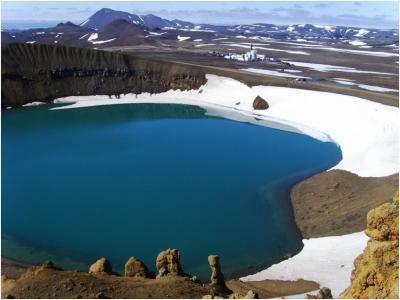 It will drill the next borehole, IDDP-2, in southwest Iceland at Reykjanes in 2014-2015. "Although the IDDP-1 hole had to be shut in, the aim now is to repair the well or to drill a new similar hole," Elders said. "The experiment at Krafla suffered various setbacks that tried personnel and equipment throughout. However, the process itself was very instructive, and, apart from scientific articles published in Geothermics, comprehensive reports on practical lessons learned are nearing completion."